Thinning hair is a lot of things; scary, confusing, frustrating – but it’s definitely not untreatable. As a matter of fact, thinning hair is eminently treatable, especially considering the amount of other, far more severe and long-lasting hair loss conditions there are out there. Having said that, hair thinning is frequently misunderstood, and can also not be taken as seriously as perhaps it should be at times. Thinning hair can often signal the start of another hair loss condition – but it could just as easily be a small problem, likely to dissipate of its own accord. That’s why it’s important to understand it. Thinning hair is a form of hair loss. It just manifests itself in slightly different ways to many other common conditions. Typically, normal humans lose an average of about 100 hairs a day. Once we begin to lose around 150 however, there is a cause for concern (don’t try to count each strand of hair you lose, but take note if it seems like more than usual when you comb or brush). If this begins to happen, there’s likely hair thinning occurring in some form. Although there are many reasons for which someone’s hair might start thinning, there is one type which accounts for almost all cases. This is known as Female Pattern hair loss, or in men, as Male Pattern hair loss. Female Pattern hair loss is difficult to diagnose as it manifests itself in a markedly different way to its counterpart. With men, hair loss and thinning is originally noticeable in the temple and front/top of the hairline; it’s less easy to apply similar patterns to the female hairline. Women follow different patterns; losing hair across the scalp, although most of it does begin at the crown. Despite the differences in hair thinning between the two gender-specific conditions, they lead to the same result. 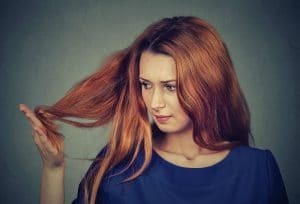 Although there is a heavy genetic component to whether or not – and how severely – someone will experience hair thinning, there are several lifestyle changes that can be made, which can prevent onset. This largely revolves around maintaining a balanced diet, with a consistent exercise and hygiene routine; while also avoiding alcohol, tobacco and other drugs in excess. If you’ve applied those lifestyle changes, and are still seeing your hair gradually thinning, don’t waste time. Get in touch with us at Advanced Hair Studio, and we’ll be able to determine just what you and your hair need. Hair thinning can be reversed, we’ll show you how.